Native ads is a new buzzword that seems to be very popular these days. Especially since Facebook has turbocharged its advertising model with this new channel. But Facebook isn’t the only one moving forward with this concept; all major newspapers are implementing native ads channels along with Twitter, Yahoo and Google with its +Post Ads. 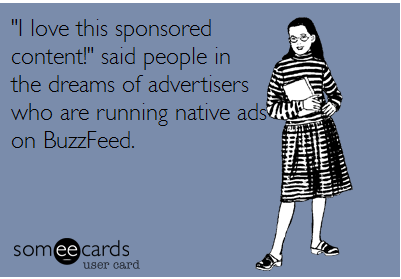 The term “Native Ads simply refer to promoted or paid content. Even though the term has became a buzzword, it is simply an advertorial. So, if you look back at the media history, it is not a very new concept, just an old traditional media channel that has been rejuvenated with a social and data layer. Content matters. The context matters even more. We used to (and still) deliver display and text ads based on audience/page/site content. With native ads, we have to look at the context to which our ads will be published. It is important to not just look at the on page keywords or theme in an automated way. We have to take a closer look at the actual context to which the on page keywords or theme are published (tragic news, product banned, or destructive critics). In any cases, make sure the context is useful and serve your strategy. As PPC Managers, we are used to the regular text ads limitation, display ads formats, and Facebook more traditional right hand side image & text. Depends on the publisher, your native ads become a deep content research with talented copywriting, careful image selection and getting ready to respond to comment (if a social feed is attached to your paid content). This brings new challenges to campaign managers including better copywriting and research. Mobile advertising has been a huge challenge for marketers. The 320×50 banner is simply not cool! Native Ads are part of the content and get a much better click-through on mobile devices. You can leverage powerful converting mobile campaigns using this channel without compromising the user experience or getting irrelevant clicks because someone accidently clicked on the bad positioned 320×50 mobile banner. A whole new level of ad engagement. If you have been using the newsfeed ads on Facebook, you probably have noticed that people have the opportunity to like your ads or even comments and share them. This brings a new level of interaction with users and also a brand control over who shares and what are the comments. Depends on the product or service you sell, you might not want to have people commenting directly on your ads. It is the same story for newspaper native ads. Once published, users can provide feedback. If the context is not right, the content is not well produced and you do not have the resources on your side to reply to comments, it can end up being a bad brand experience for the users. It is definitely a channel you want to explore. Let’s face the true; since Facebook has introduced the newsfeed ads, we don’t really see the value of the right hand side ads unless they are delivered into a remarketing campaign. Native ads on Facebook have changed the way content and social media connections are used by marketers. We see Facebook campaigns with +1% CTR and much higher conversion rates. Twitter is also a great source for native ads campaigns. For those of you who watch the 2014 Superbowl both on television and Twitter, Budweiser did a very good job at promoting a series of contest on twitter leveraging a massive reach using the hash tag #SB48. Of course one of the massive changes from the old fashion advertorial to the native ads are data and analytics. Marketers have the opportunity to measure and optimize (the same way we do for our PPC programs). The only difference is native ads are embedded into content. People can consider them as regular content and comment or share. It makes optimization achievable but less responsive and you have to spend more time into the research and planning to increase to a maximum your chances of targeting the right mix (context/content/audience/destination). In conclusion, native ads are great and powerful, but as internet marketers, we need to adapt to include more contextual data, improve copywriting and being more responsive in the case of comments and share. Remember, native ads are paid pieces of content, not actually “ads”. It does make a huge difference for the user.